In December I went to Las Vegas with my husband for his conference. 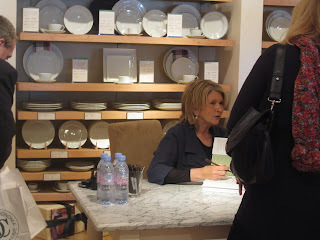 While there I went to a book signing of Martha Stewart's new cookbook: Dinner at Home. After standing in line for three hours (thank goodness it was Las Vegas and not Ann Arbor in December!) I made it in to get an autograph on the cookbook. We were told she would not pose for photos with us nor personalize the signature. But she was very gracious and chatted with everybody. She was very nice and pretty; much nicer looking than on TV! Above, she is talking to TV cameras in Las Vegas before she started signing books. 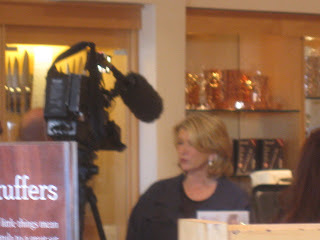 In the photos above, Martha Stewart is signing books. We could go to the "Photograph Area" and take a picture. 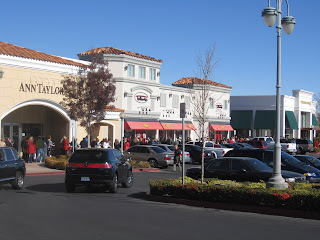 And I also show the line that went on and on outside the Williams Sonoma shop where the book signing took place. Since I was in the front of the line I had my book signed and even had gone to lunch and then come out to see the line continuing! 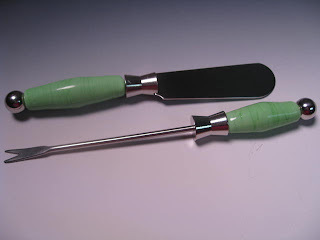 The photo above is of the appetizer set that I made for Ms. Stewart with lampwork glass beads. I used a color that I call "Martha Stewart Green" (hey, I watch a lot of the Martha Stewart Show!!). You could not give your present directly to her so I don't even know if she received it! But I put it in a Beaver Island Jewelry box and bag and put my business card with it. I had to give my present to someone before I got my cookbook signed. I suppose she receives lots of gifts. 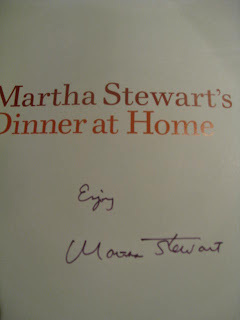 So, I got my autographed copy of Martha Stewart's Dinner at Home and went back to Michigan clutching my copy. 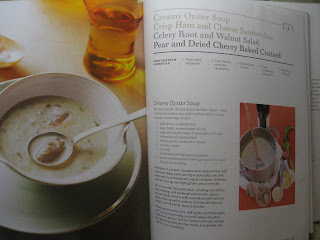 Later in the month we watched the movie Julie & Julia where Julie went through the Julia Child French Cooking Cookbook and made all the dishes. Ahhhh Haaaaa! 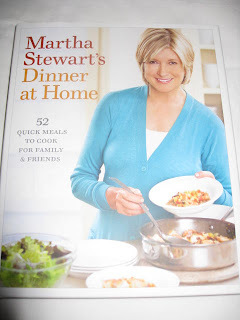 I decided I should try making the menus in my new Martha cookbook! (Much to my husband's delight!). Winters are long and dark here in Michigan!! 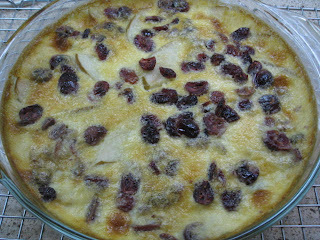 Pear and Dried Cherry Baked Custard. 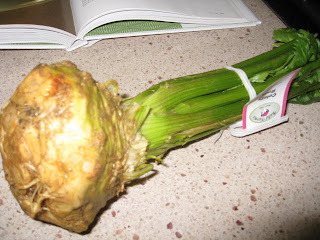 The salad called for celery root which I had never heard of nor seen. It was lucky that my grocery store had it marked as such! Here it is in it's raw form and then the salad. My husband did not care for the Celery Root Salad although I thought it was good and the dog enjoyed some raw celery root. The sandwiches were great, the oyster soup good and the custard very good. My husband gave my menu a "8 out of 10" on his scale! 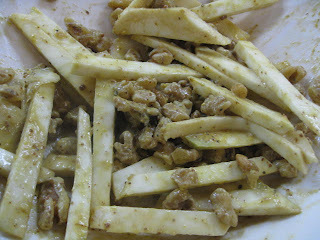 That was my first Martha Stewart's Dinner at Home menu attempt. More later as I try other menus! Don't know if I will get through the whole book but that is my goal. 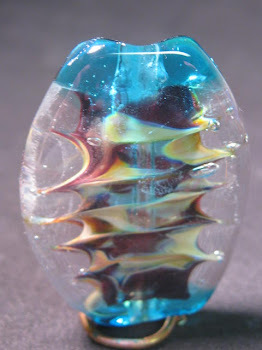 Please visit my website at Beaver Island Jewelry to see lampworked appetizer sets such as shown here in my blog along with other lampwork bead items. Nancy: I hope Martha gets to see your gift - it is gorgeous!